In the event you choose PayPal as a payment method, the terms and conditions of PayPal shall apply in addition to these Payment Terms. Any additional fees charged by PayPal are your sole responsibility and you authorise Minicabs UK Ltd to take payment from your default or selected payment method on PayPal. 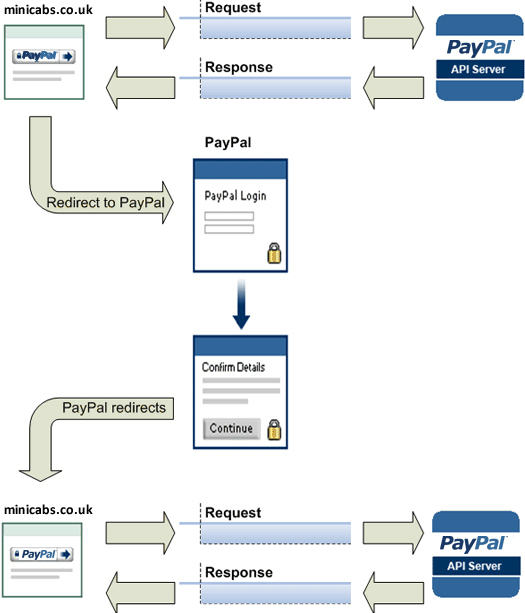 1.1 Linking your paypal account refers to allowing Minicabs UK Ltd to request permission from paypal for a token that will allow for future purchases to be made using paypal without re-entering your username and password. These details are never accessible by us at any point. 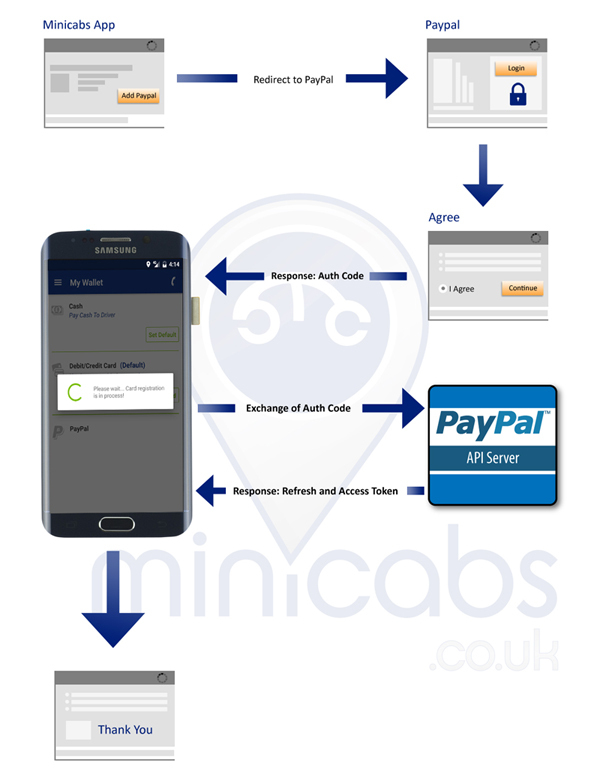 To set this up you will be redirected to Paypal’s website where you will be required to log in and accept the terms and conditions to allow Minicabs UK Ltd to charge you for your bookings through Paypal. By setting this app Minicabs UK Ltd will take the relevant payment for each journey using a reference transaction ID from your first transaction to initiate subsequent transactions. 1.2 Upon linking your Paypal account a small authorization payment may be put on your account to verify your details. Similar to the card payment authorization this will not be debited and will automatically be removed in 3-5 Working Days. 1.3 Similar to your card details, Your paypal account can be unlinked at any point from the wallet section of the app. If your Paypal account is unlinked then it is not possible for future payments to be paid through Paypal using One Touch Bookings. It will need to be linked again to pay for any journey using Paypal. 1.4 When placing a booking using paypal, you allow us to debit your account using the default payment method on your account for future reference transactions. 1.5 Any booking that is paid by Paypal which has been cancelled, the refund will be processed between 2-5 working days. This includes reference transactions. 1.6 When being charged your fare for the journey Paypal will by default use your paypal balance if any then your default payment method. 1.7 Any booking that is paid by Paypal which has been amended and/or subsequently due a partial or full refund will be processed between 2-5 working days. To delete consent for PayPal future payments for an app, log into your PayPal account profile at https://www.paypal.com/, and access My settings. For the Log in with PayPal setting, click Change and remove the mobile app from the list. 2.1 To check the cost of a minicab journey click here. 2.2 If you chose to pay for a minicab journey via card then a preauthorization request will put on your debit or credit card. This charge of £1.01 will only be placed when you link your card for the very first time. You agree that we may undertake the relevant authorization checks on any payment details you have provided us. 2.2.1 Upon linking your card for the first time, 3D security will also be used. You will be required to enter the necessary security measures put in place by your bank. This will only be required for the first time allowing your card to be saved. Subsequent payments using the same card will not display a preauthorization charge. 2.2.2 This preauthorization charge is only a hold on the funds in order to verify the card details. This hold is removed within 3-5 Working days. This may differ depending on whom you are banking with. 2.2.3 Linking your card means allowing your card details to be stored securely so when a booking is made no card details are required to be entered. 2.2.4 You have the option to link your card and this can be unlinked at any time from the wallet section of the app. Once unlinked it will need to be linked again to pay for any journey using Card. 2.2.5 Payment details will only be stored, allowing you to make your payment via card when you use our services and/or to collect any money you may owe us. 2.2.6 Any booking that is paid by card which has been amended and/or subsequently due a partial or full refund will be processed between 2-5 working days. 2.2.7 Any booking that is paid by card which has been cancelled will be processed between 2-5 working days. 2.2.8 Any prepaid refund query in relation to a minicabs booking will need to be dealt with them. They can be contacted on help@minicabs.co.uk.